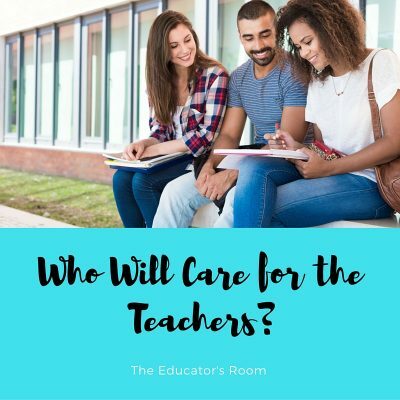 Who Will Care for the Teachers? When I sat down to write this piece, my purpose was to scribe a thinly veiled, autobiographical accounting of my own experience of surviving the middle school classroom while I struggled with depression. However, wanting to avoid the cathartic-memoir trope, I planned to include information on the prevalence of depressive disorders among classroom teachers .I was shocked to discover how little research has been done on this topic from the teacher perspective. A quick exploration of the Education Resources Information Center (a digital library of education research and information) revealed only 5 peer-reviewed articles published in American academic journals in the past 5 years. Casting a wider research net, to include psychology journals, delivered a richer selection of research, although (as with the educational journals) much of that research focuses on the impact a teacher with depression has on student achievement, rather than on what factors could contribute to or worsen a teacher’s experience with depression. On the one hand, this lack of academic inquiry into teacher depression is astonishing. Teaching is consistently listed as one of the top ten most stressful job in the US. This is certainly a contributing factor in the large numbers of teachers leaving the profession every year (30 percent of teachers leave their positions within their first three years in front of students). Dozens of studies are conducted every year investigating this phenomenon. These studies explore factors such as administrative support, the pressures of evaluation and testing, the condition of the school building and student behavior. However, they rarely address health and wellness of educators. The other hand, it is not surprising at all. The most common mantra in education is, ‘it’s about the kids’. Indeed it is. However, in past decade, ‘being about the kids’ absolutely excludes ‘being about the teachers.’ Mandate after mandate imposed on school districts require teachers to learn new curriculum, new instructional strategies, and a new evaluation system. Teachers are being asked to differentiate down to the needs and abilities of each student. These are all noble and necessary endeavors: but, teachers have received no additional time, resources or compensation to allow them to master these changes. Robin Besse and her colleagues published a study in 2015 that reinforces that which is already known about depression in general and applies it to the teaching profession. Teachers who report enduring high levels of stress and anxiety, as well as feeling little self-efficacy and job-control, were more likely to have symptoms of Major Depressive Disorder. Stress, anxiety and depression intertwine to create a cycle from which it is difficult to escape. The more ineffectual teachers feel, the more they feel unsupported by the community and their administration, the more likely they are to fall into this cycle. Returning to the discussion above, and the concept of “keeping the kids at the center of all we do,” I ask, “isn’t there room in there for the teachers, too?” Many teachers have a natural altruistic bent to their personality. They are nurturers to a fault, denying self-care in favor of caring for the social, emotional and academic development of their students. So, who will care for the teachers? Unfortunately, the crushing weight of new mandates, new curriculum, new instructional strategies and new assessments eats away at the most precious commodity a school district has to allow for professional learning among their cadre of educators: time. As districts scramble to prepare teachers for their students, there is little to no attempt to fortify teachers’ health and well-being for the challenge. Local budgets are dwindling and district administrators are under immense pressure to make Draconian cuts to spending. Any money previously earmarked for employee health and wellness is a difficult sell to the decision makers and an easy first cut. Despite the fact that research has demonstrated that an educator is more effective and more likely to remain in their current position with the physical, emotional and professional support of their administrators. I believe there is a universal misprioritization of teacher wellness within the educational field. A fact that became all too real to me as I pushed through a teacher wellness initiative in my district, which consists primarily of building a community of mindful practice, in and out of the classroom, as well as food and fitness challenges. In order to underwrite some of the virtually insignificant expenses to support these activities, I accessed monies in my budget earmarked for teacher development and retention. The request was denied. Before I could use this money, I had to explicitly draw the lines connecting the dots between teacher health and wellness and instructional effectiveness, reduced absenteeism and increased teacher retention. Who will care for the teachers? I believe it is the responsibility of a school district to make the mental and physical health one of their priorities; simply one area of focus in a larger District Improvement Plan. We cannot continue to try to cram every new initiative and mandate down our teachers’ throats without giving them something to sooth the experience; to let them know they are appreciated and valued. -Bring mindfulness into the classroom. Use yoga with the students to promote self-care and self-monitoring. Schools that use mindfulness and yoga with their students have experiences an increase in student focus and a decrease in behavioral referrals. -Bring mindfulness to the teachers. Offer teachers time, space and training to help deal with the stress inherent in the teaching profession. -Principals, be sure to recognize the efforts of each and every teacher in your building. Do not focus on ‘the best’; rather, recognize personal best and improvement. -Find the time at the beginning or end of meetings to afford teachers the opportunity to touch base and make connections with colleagues they rarely see, and even more rarely have the opportunity to talk to. -Take every opportunity to validate for teachers that the stress they feel is real; and that it is navigable with the proper tools and support . Besse, R., Howard, K., Gonzalez, S., & Howard, J. (2015). Major depressive disorder and public school teachers: Evaluating occupational and health predictors and outcomes. Journal Of Applied Biobehavioral Research, 20(2), 71-83. Connors, N. (2000). If you don’t feed the teachers, they eat the students. Incentive Press, Nashville. Kidger, J., et al (2016). Teachers’ well being and depressive symptoms, and associated risk factors: A large cross sectional study in English secondary schools. Journal of Affective Disorders, 192, 76-82. Thank you for this article. I really needed the validation. I am experiencing the PTSD, & teacher’s situational depression as I write. I am one 3 types of medication. Place on medical leave for the remainder of the school year, and have been denied workman’s compensation. No one takes care of us. We are in an abusive relationship. Our abuser is the political beauracracy and financial gain of the deviants who created a cycle of deciet in job security. It is our passion that keeps our hope alive, otherwise, we are just gluttons for punishment. And they continue to take knowing the statistics about the teacher shortage crisis. IN the end, our future suffers. I have been asking this question for years. There is a real challenge with the evaluation and remediation process that teachers have to go through. As the stress of being under the microscope increases, performance drops. It is a cycle of death of a career. Even if you can get accommodations for having depression, they say you are unable to complete the job tasks and let you go. When the leadership in one of the largest national teacher’s unions, says “perhaps that teacher should be coached out of the profession” there is no help for teachers with depression. This article is much needed. My last year teaching was my worst teaching experience ever. I was finishing up graduate school, raising two young children on my own, and teaching a subject that I knew nothing about. I went from being a top teacher with high test scores to a teacher floundering at the bottom. Then I had an administrator who shamed me during a staff meeting. It was at that moment that I decided to quit. I didn’t quit teaching, but I quit being engaged and trying to create these wonderful lessons. I was just showing up to work. It wasn’t until returning from Spring Break that I returned to the teacher that I aspired to be. Unfortunately, the school year was almost over by the time I made that decision and the damage had been done. Teacher wellness must become a priority! I recently wrote a similar piece for my blog titled, Teachers Need Social Emotional Learning Too. The stress level for educators is too high and doesn’t seem like it’s letting up any time soon.